Camp-Riley Drug Company was well known for two of its products: its chocolate syrup, which was William Guy Riley’s formula, and a cough syrup called Tolu-Terpin, which was Walter Camp’s formula and was sold at M.A. 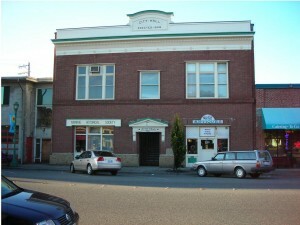 Weed’s Drug Store in Seattle and at Camp-Riley in Monroe. Walter Camp was working at Weed’s store when he compiled the formula. It was prescribed by some of the local doctors and also sold over the counter until the pharmaceutical companies forced the doctors to prescribe only their formulas. After that, it got to the point that it was rare to find a pharmacist who knew how to do compounding. Walter Camp later complained that now the only thing you needed to be able to DO as a pharmacist was to count to one hundred. Walter S. Camp was born Feb. 2, 1885, at Rowlette Creek near Allen, Texas, which today is within the Dallas city limits, into a family of five brothers and three sisters. He graduated in pharmacy at the top of his class from Baylor College and was awarded a gold medal. One of his professors wrote a letter to the Philadelphia College of Pharmacy and Science recommending him as a graduate student. At that time Philadelphia was the prestigious school of pharmacy in the United States. Camp loved chemistry saying that it was the most beautiful subject in the world because everything fit together just like a picture. He made an average of 99 in his three chemistry examinations at Philadelphia. Walter Camp and Guy Riley met at Philadelphia following Riley’s six-week bout with typhoid fever. Riley needed some tutoring to catch up and one of the professors recommended Camp to tutor him. It was the beginning of a long and fast friendship. Camp said that Riley had the finest principles of any man he had ever met. William Guy Riley was born in Pennsboro, West Virginia, and was orphaned at the age of five. He was reared by an aunt and uncle and worked his way through school. In 1906, both men completed their dissertations for a doctorate in pharmacy, then went their separate ways. Riley went to Florida for a while, made a trip to Alaska, then settled in Seattle where he worked for M. A. Weed’s Drug Store at 26th and Jackson. Walter Camp came west to Seattle because he heard that pharmacists were being paid $100.00 a month, which was his goal, and also went to work for M. A. Weed. He was offered a job teaching pharmacy at the University of Washington but they couldn’t meet his $100.00 goal. While working in Seattle, Camp heard about a wonderful place called Monroe that had no graduate pharmacists. He was so impressed with Monroe that he borrowed money from his father, and he and his brother Birt formed Camp Brothers Drug Co. Their first day of business was October 22, 1909. In November of that year Monroe was isolated by floods, and a child was ill and needed a prescription involving a medication the new drug store didn’t have. Walter Camp walked the railroad track to Wilbur’s Drug Store in Snohomish to get it. He had played football and a lot of baseball and was a good runner. Camp was made town clerk right after he came to town, and at the beginning of the year, he collected license fees from thirteen saloons at $1,000.00 each. He said he had never seen so much money. 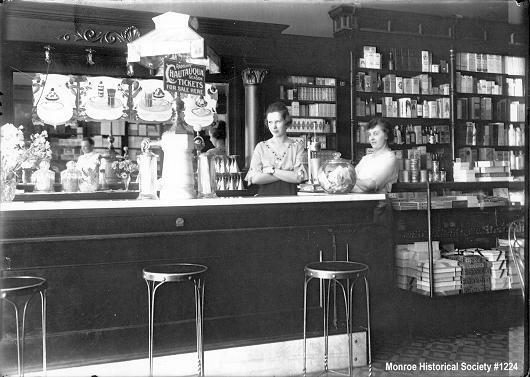 On April 1, 1912, Riley bought out Birt Camp’s interest in the drug store and moved to Monroe. He was still a bachelor at that time although he had met Amelia Ella Strassburger while working in Seattle and they were married on Sept. 17, 1917. 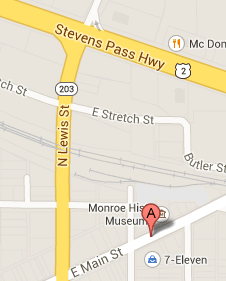 When they came to Monroe, they lived for a short time in the Savoy Hotel, then purchased their home at 416 West Main St. They lived there until Riley sold his interest in Camp-Riley in 1946 and moved to West Seattle where he lived the rest of his life. Walter Camp was also a bachelor when he came to Monroe, but he soon met Bertha Shrum, who was working at the post office in the Hotel Pearsall a few doors east of The Camp Brothers Drug Store, which was at 120 East Main Street. They were married August 30, 1910, in Eliza Malone’s home on North Ann Street, an area now occupied by the Albertson’s shopping Center. In the early days of the drug store, they opened at 6 a.m. to accomodate the farmers who brought their milk cans to the early trains and stayed open until 11:00 p.m. for the late shopping loggers. Sometime in 1912, the drug store was moved to 108 East Main where it remained until 1980. 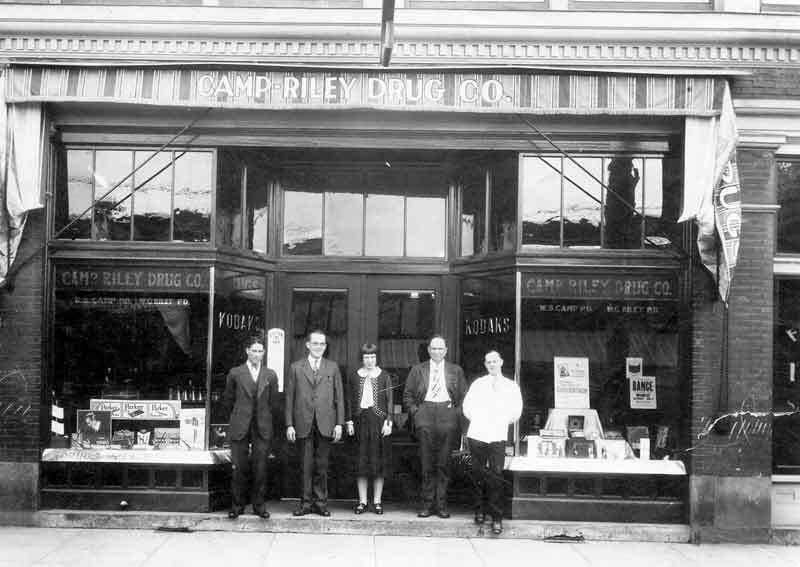 It was Camp Bros. Drug Co. for 2 ½ years and Camp-Riley Drug Co. for 68 years. 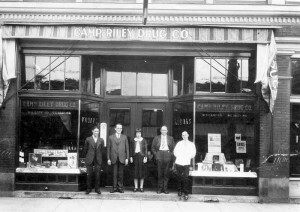 In 1916, Camp-Riley Drug Company of Duvall was operating in a small frame building in the first block on the left as you entered Duvall from Monroe. They dubbed it the twig because it wasn’t big enough to be a branch. On July 10, 1916, after the store was robbed, the stock and fixtures were sold to George H. Erickson for $3,076.35. Many a Saturday afternoon at Camp-Riley in Monroe was spent making that wonderful chocolate syrup for the soda fountain. It was made of a combination of Drosti Dutch and American chocolate, and it was stirred from the time it was put on the stove until it was completely cold to keep the cocoa butter from separating out. The strawberry milkshakes were the best. Only Marshall berries were used because they were red all the way through. The berries were washed, stemmed, put through a potato masher, sugared, then stored in the frozen-food locker. 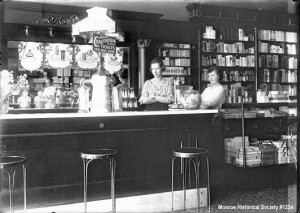 The soda fountain had to be polished every day, and the brass trim on the front of the store had to be buffed with Bartender’s Friend, and the floors were scrubbed every Thursday night. But along with the hard work, there was a lot of fun—the oyster stew bashes in the back room and the horseshoe games in the “back forty” were particularly memorable. The telephone number in the prescription room was 61, but there was a courtesy phone up front on the cigar counter for the public to use, number 73. The West Coast Telephone Company eventually removed it as unfair competition. 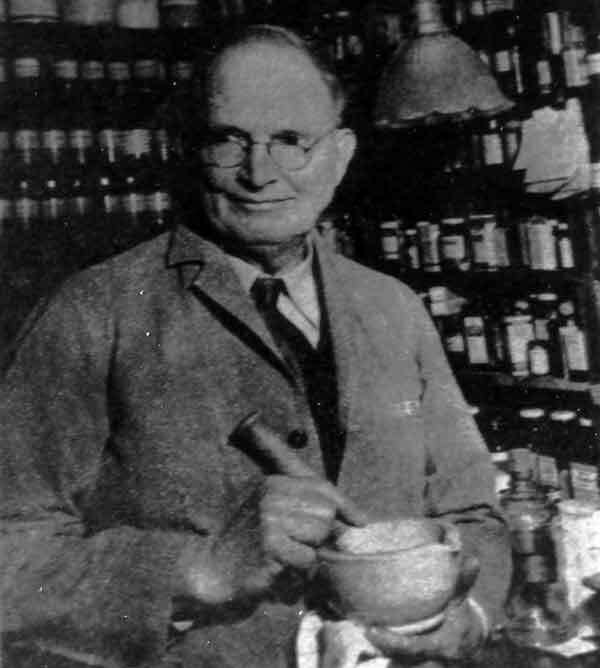 On August 1, 1949, Gordon Tjerne, David Campbell, and Ray Bolton bought the drug store from Walter Camp. Campbell sold his interest in 1962 to Keith VanderHowen. In 1980, VanderHowen closed the Camp-Riley store on Main Street to consolidate operations with Tri-Valley Pharmacy, which was then in the Old Monroe Shopping Center by the condensery smokestack. Tri-Valley later evolved into Monroe’s Pharm-A-Save, now located near Valley General Hospital. Camp-Riley left behind a 3½ by 6 inch leather booklet with hundreds of names in it. A small prescription label was placed on the cover, and on it was typed (with that old Underwood typewriter used in the prescription room) “gone but not forgotten.” Bad debts listed for 1947 were $149.13. 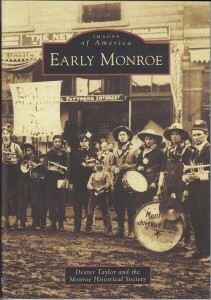 Camp-Riley also sent three young Monroe men to college: Charles Low, David “Rusty” Campbell, and Allan Campbell. Walter Camp served two two-year terms as mayor and was chairman of the water committee when the city created a public water system using Sykes’ Springs. The water was of such high quality that it was used as is in automobile batteries. The previous water system was privately owned. Camp served many years on the County School Board when Dorothy Bennett was County Superintendent of Schools. He was always a promoter of education. Walter Camp died at his home on West Main Street in l966 at age 81. –Grace Kirwan was the daughter of Walter Camp.